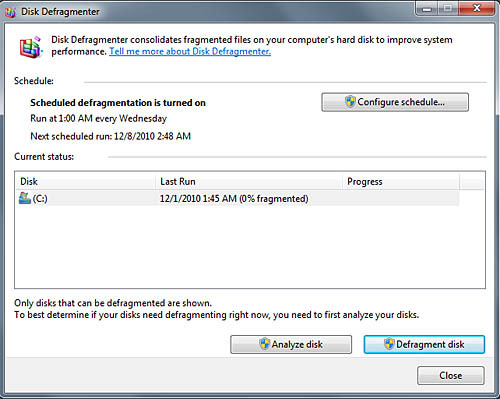 In Part 2 of optimizing your system, we are going to take a quick look at the Disk Defragmenter utility. This program helps to streamline your hard drive by moving stored data into sequential segments. When data is saved to a hard drive, the data is placed into sectors. As old information is deleted, these blank sectors can become scattered throughout the drive, and it takes longer for the hard drive to read and index the data. 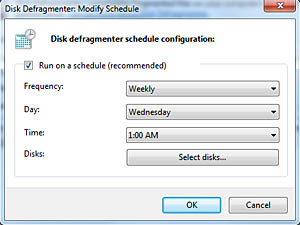 Disk Defragment moves the data sectors in order for optimal drive performance. 1. Go to Start » Accessories » System Tools » Disk Defragmenter. Or type in Disk Defragmenter into the search box. 2. Select the disk that needs to be defragged (usually disk C unless a secondary hard drive is installed). 3. Click on Analyze Disk button. This function will generate a report showing whether the disk needs to be defragged or not. 4. 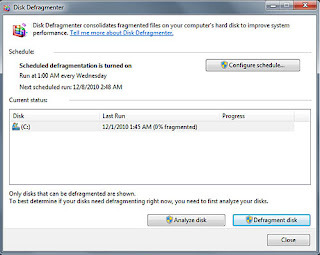 If the Analysis report recommends defragmenting the disk, click on Defragment Disk. This process may take several minutes depending on the amount of data and size of your hard drive. Microsoft Support. How to Defragment your Disk Drive Volumes in Windows XP. Microsoft Support. Improve performance by defragmenting your hard disk.